Villa Chloe is situated on Kastalia Park, a quiet development set around a beautiful ravine between the village of Peyia and the beach resort of Coral Bay. It offers modern, spacious open plan accommodation, furnished to a high standard and perfect for both couples and families. There is a large master bedroom with ensuite, a further double bedroom (with its own private patio area) and a spacious twin bedded room, with two further shower rooms. There is also a sofa bed in the living room which enables the villa to sleep up to 8 if required. Outside, there is a large patio area, with a gas bbq and room for both dining (under a pergola) and relaxing. Inside, air conditioning, wifi and satellite tv are provided, as well as a large collection of books and dvds. There is also use of a washing machine and dishwasher. Villa Chloe is in walking distance of the popular Neo's Sport Bar and Restaurant and less than a five minute drive from Peyia and the restaurants and shops of Coral Bay. We can arrange a pick up from the airport at a cheaper rate than the local taxis and welcome packs of groceries can be arranged to be paid locally. Beach towels can also be provided on request. I lam a teacher living in a coastal resort in Kent and have three grown up children. The villa was initially bought as a family home whilst the children were young and we just allowed family and friends to use it. Now that the children are all fully grown, and we are using the villa as a family much less, we thought we would rent it commercially. We were initially looking a villas nearer the beach, but realised they would be much noisier. We fell in love with this location because of the secluded nature of the small development and the beauty of the ravine. The two adjoining developments - Kastalia Park and Kastalia Springs - are, even in the height of summer, incredibly quiet. The location between Peyia and Coral Bay we feel in perfect and the view right down to the sea is breathtaking. The recently refurbished main bathroom boasts a large walk-in shower. There are a further two shower rooms, including one downstairs - handing for coming in straight from the pool or the beach! Beach towels available upon request. Their are washing facilities available - and detergent is provided under the sink. We had the good luck to be able to rent this lovely villa the last two weeks in August. It was very spacious and very well equipped with everything you needed, from towels and bed linens through to a vast collection of DVDs, books and kitchen utensils etc. The outside area was lovely with the pool at the front overlooking trees and shrubbery with a lot of privacy as the villas are situated on a small close. It was very nice just to sit outside and admire the view. If you had any problems, the key holder Fiona, was just a few villas away. You will need a rent a car as it is a bit of a walk to the shops, but in walking distance (10 mins) was a nice restaurant called Neo's which we visited several times. We very much enjoyed our stay and looking to rent this villa again next year. Thank you Terese. We thoroughly enjoyed our stay at this well equipped villa. It is surprisingly spacious and provides great facilities. The pictures don’t do it justice! 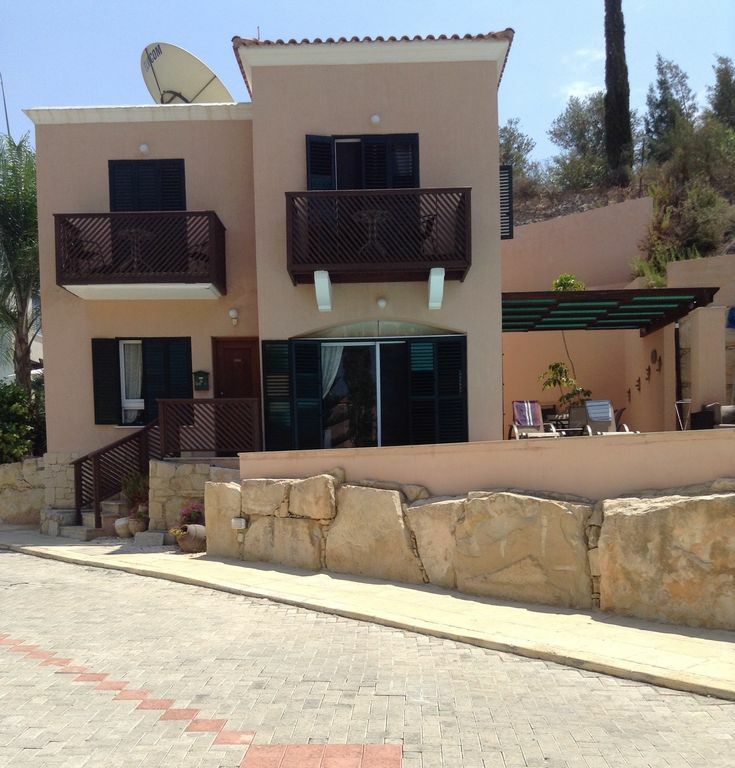 The location is perfect, very peaceful and ideal for exploring the coast, Peyia, Coral Bay and Paphos. The property owner, Terese was very responsive from initial booking and provided all the essential information required for arrival and we found the property manager Fiona to be both friendly yet respectful of our privacy. We would not hesitate to book this property again. Thank you Terese, we had a fabulous holiday! Lovely house. Everyone, from the 1 to the 80 year old had a wonderful holiday! Thank you so much. I am so glad you enjoyed your stay. We were a family of 3 couples. We were very impressed with how clean the villa was and we had a problem with one of the the air conditioning units and the man was there first thing in the morning. Rob and Fiona was very helpful and lovely people. We loved how near to everything it was. Although the pool is at the front of the villa it is very private and quiet. We would love to return as we very impressed with the villa and Cyprus. We would also like to say the use of the car was brilliant and we also hired a car from Brit cars in Paphos who we would highly recommend as well as this villa. Thank you for your kind comments. Fiona and Rob have been looking after our villa since we first bought it (and well before we even considered renting it) and we feel very grateful to have such lovely people overseeing it for us. I'm so glad you all enjoyed your stay and hope you will consider staying with us again. We stayed the second week in June. Lovely spacious villa with all you need for a self catering holiday. In quiet residential area. Even though the pool is at the front of the property, you don't feel exposed as trees have been planted in front of the other properties and make a lovely outlook. Close to nearest town & beach but not walkable. In all a lovely relaxing holiday. Made a good base for visiting that side of the island.